Even though Home Trust, one of Canada's largest alternative lenders, publicly said it wouldn't finance any more HVAC rental contracts from one company after that company faced a slew of consumer protection act charges in 2016 — Home Trust continued to buy very similar contracts from other companies. CBC News has reviewed land title records for half a dozen homeowners from Toronto to the Ottawa-area, that show Home Trust security interests — more commonly known as liens — were registered against their properties. Here's how homeowners end up with those liens. First they sign a contract to rent a furnace, for example. The HVAC company then gets an alternative lender like Home Trust to finance the contract. To guarantee it recoups its money the alternative lender then puts a lien for the furnace on the homeowner's property as collateral. That means for the length of the contract the homeowner can't sell their property without first paying off the lien. The liens CBC News reviewed were registered after the company's decision to not finance some HVAC contracts, and are worth anywhere from $5,000 to $20,000. Most of the contracts were sold to homeowners by door to door salespeople before the province banned those sales last year. As an alternative lender Home Trust is better known for its business providing financing to people with a poor credit rating who might not be approved for a mortgage by a retail bank. Howard Regan didn't find out about the three contracts his 83-year-old father had signed until after Home Trust had registered $25,000 in liens for the equipment on the retired professor's Toronto home. 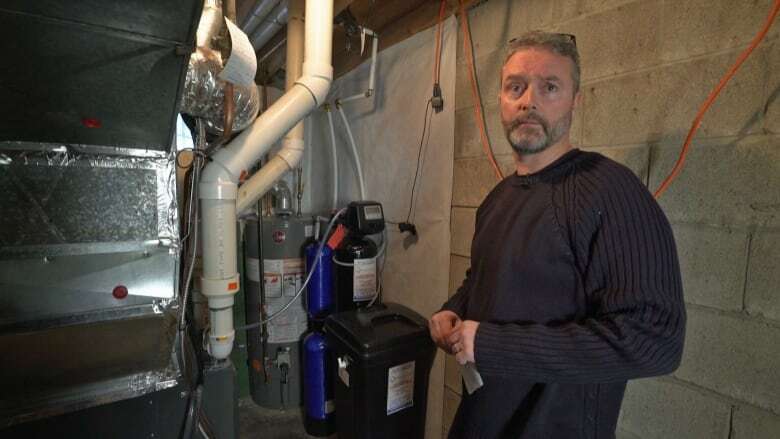 Regan priced out what his father is renting and told CBC News the furnace, air conditioner, water softener and water filter are worth thousands of dollars less than the liens registered on his dad's house. "These people are clearly predatory," said Regan, about door-to-door sales. "They're going after the elderly people that don't quite understand what's going on." "And without the lenders backing this up it wouldn't happen." In a statement the lending company told CBC News that "at all times, Home Trust Company works to ensure that its partners and suppliers conduct themselves appropriately." And its "due diligence process includes regular reviews of all counterparties to ensure compliance with all laws and regulations." 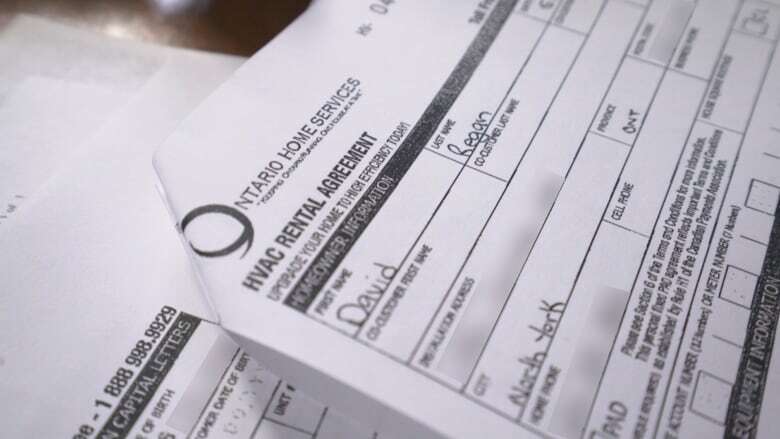 In terms of these kind of contracts, Home Trust says it "ceased to be in the business of financing any new HVAC rental agreements" in Sept. 2018. That decision comes two years after the company told CBC News it had stopped taking on "rental agreements from OEG under the income-stream purchase agreement." In 2016, Ontario Energy Group (OEG) was facing 142 consumer protection charges for allegedly using false, misleading or deceptive practices, failure to deliver a valid contract and failure to issue a refund. Those charges were later dropped in 2017 when the company reached an agreement that it would settle each of the complaints. When asked why Home Trust stopped financing rental contracts from other companies two years after the OEG decision, spokesperson Jill MacRae said in a statement to CBC News, "our core lending business is providing mortgages and we determined that this much smaller line of business was not a fit with that focus." But that decision doesn't seem to help those like Regan's father David who is facing thousands of dollars in liens from the company. Regan told CBC News that his dad didn't need the equipment he signed long-term contracts to rent when Ontario Home Services came to his door on back-to-back days in July 2017. He says his dad's furnace and air conditioner were "less than 10 years old" and there was "nothing wrong with them," when the HVAC company showed up. "It's sort of a double hit," Regan said about the equipment. "It wasn't just that they sold us these incredibly expensive ones but they actually ripped out perfectly good ones to replace them." Regan says his father is "quite upset" about the contracts and told him that all the door-to-door sales people said they were with Enbridge Gas. "I don't understand the law, but a lot of this feels like fraud when they come up with a yellow safety vest saying they're from the gas company and putting papers in front of people and saying 'just sign here,'" Regan told CBC News. In an email, Ontario Home Services said Regan's father was "advised that we have no affiliation with Enbridge Inc. and or Enbridge gas distribution, any current service provider or any government agency." The HVAC company also wrote that "based on the documentation we have Mr. Regan acknowledged and agreed to all terms and conditions." Regan has since moved his father into a retirement home and is working on fixing up his dad's house to sell it. Before he can sell, the liens on the property have to be lifted or paid off. "I think it's wrong," he said. "They're not just doing this to people like my father. They're doing it to people that can't afford this." "[My father] has hundreds and hundreds of dollars being extracted from his bank account every month — that could affect somebody so that they can't even eat properly." John Robinson says that's true for most of his clients. For nearly five years, the Cornwall, Ont. paralegal has been representing homeowners who bought into HVAC rental contracts. 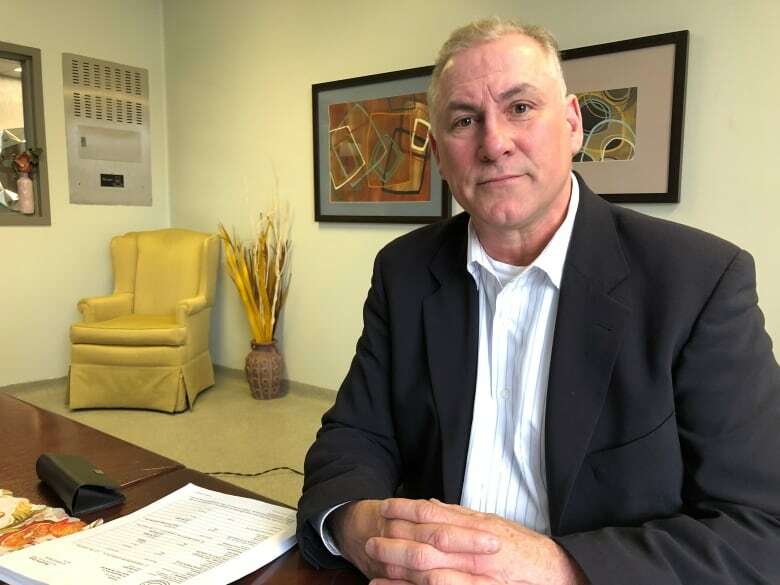 From the contracts and liens Robinson has seen, he says "most of the financing comes from Home Trust," although there are other "smaller financial outfits" backing these kinds of contracts as well. "Most of these people are on fixed incomes," he told CBC News. "Their home is their safety net." 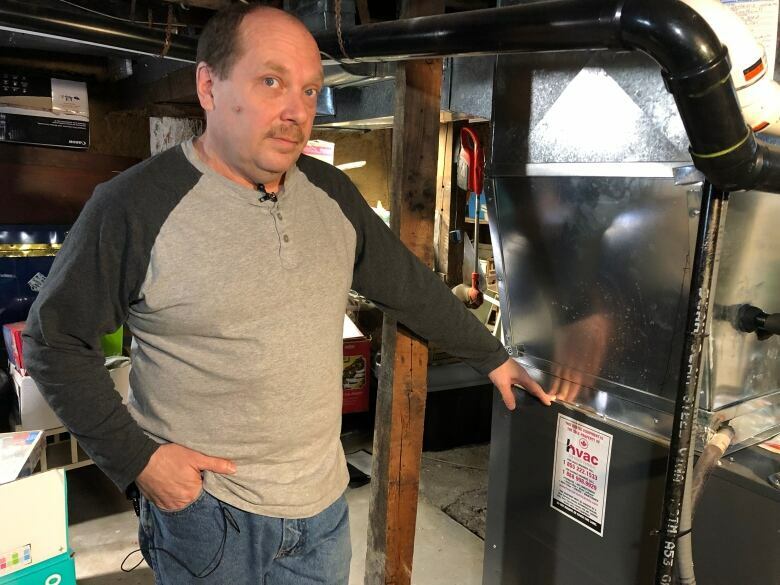 For one of Robinson's clients, Randy Dennison, the contract he signed with an HVAC company for a new furnace and an air conditioner has become "just another kick" after getting "kicked down a few times." Dennison lost his job of 25-years when the Philips Canlyte plant in Cornwall, Ont. closed almost five years ago. His wife also worked at the plant and both of them now have part-time jobs to support their five-year-old daughter and their five grandchildren who live with them. The school bus driver has a more than $13,000 Home Trust lien registered on his home for the furnace and air-conditioner he's renting. Dennison says he only realized something was wrong with the agreement once he tried to reach out to the HVAC company when the air conditioner stopped working and no one returned his calls. "You're paying for a product that's supposed to be under warranty, warranty covered, maintenance covered," he said. "And all of a sudden now I have to hire a contractor to come in to check it if something goes wrong with it." CBC News reached out to the company repeatedly but it did not respond to our requests for comment. Robinson is suing Home Trust on behalf of Dennison, and several other clients, for its alleged role perpetuating "flawed" HVAC rental contracts. "They claim that it's all above board because it's on this fine print on the back of the document that people sign. But the people are being deceived by these companies," said Robinson. 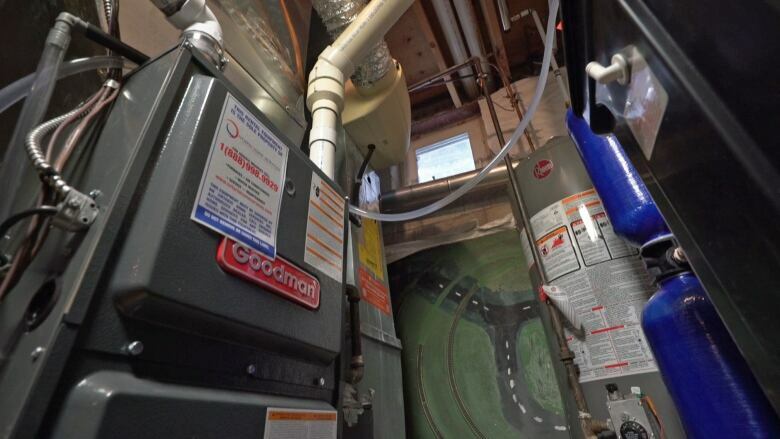 The paralegal believes "many" of these other HVAC rental companies are "doing the same thing that OEG was doing with almost identical contracts." "It's irresponsible of [Home Trust] to just decide not to continue with those agreements with one company because of the charges, but to carry on with all the other companies," he said. In response to specific questions from CBC News, Home Trust said "it would be inappropriate for us to comment because this is now a matter for the courts."